An air strike near a hospital in north-west Yemen that killed at least seven people, four of them children, has been condemned by Save the Children. The NGO, which helps fund the hospital, said two other adults were unaccounted for after a missile struck a petrol station close to its entrance. Kitaf rural hospital lies about 100km (60 miles) from the city of Saada. It had been open for half-an-hour and many patients and staff were arriving when the missile hit. The dead included a health worker who died along with their two children, Save the Children said. 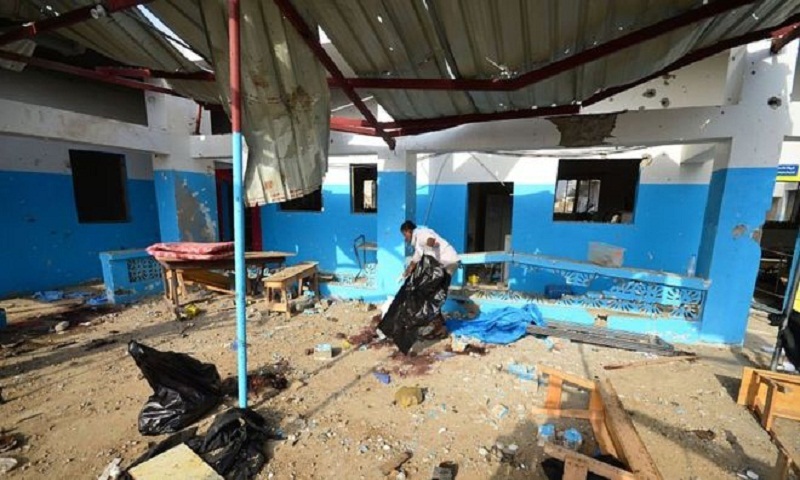 A further eight people were wounded in the attack, which is believed to have been carried out by the Saudi-led coalition fighting Houthi rebels in the country. The coalition has almost complete control of Yemeni airspace. Save the Children has condemned both sides in the war for their conduct, in particular highlighting the effects on hospitals. The NGO, which says 37 children a month have been killed or injured by foreign bombs in the last year, has demanded an urgent investigation into this latest missile strike. "Innocent children and health workers have lost their lives in what appears to been an indiscriminate attack on a hospital in a densely populated civilian area," said Kevin Watkins, chief executive of Save the Children. "Attacks like these are a breach of international law... But time after time, we see a complete disregard by all warring parties in Yemen for the basic rules of war."